I love this phone. It has all the advantages of the U700 without the constantly broken flex. Very stylish too. The Nokia 6500 classic is not the worthy rival of the Samsung U800, for that position's rightful owner is the Sony Ericsson T700. They have essentially the same features. 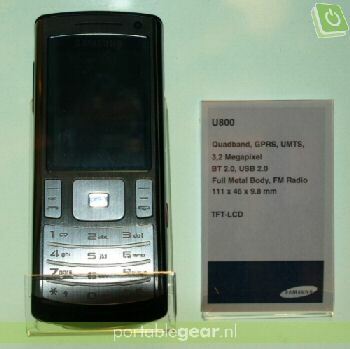 I had to pick between this phone and the nokia 6500 classic. It was a really tough choice. Eventually I went with the samsung mainly because of the better camera. It also has faster internet (hsdpa) radio, expandable memory. But most of all the camera is better. The panorama function on it is a cool thing they added. But i have to say though, the nokia looks better and is thinner. I still have mixed feelings about my choice because looks is very important to me. I just wish the nokia had a better camera, i would have bought it for sure. When will it be available in the different colours?? It looks amazing, but LG will do a copycat. How much is this phone cost? It took them a year to build a comparable phone which is slightly better than Nokia 6500 Classic. Yes it's better than the Nokia, but what is the point? well if we all think about it nokia just went and copied samsungs slim phones they just didnt make it in a slide they made it a 1 unit phone so i reali dont think nokia is sooooo gud at bein the first to design the slim phones. if samsung want to just take there idee back and make it look better than nokia then why not?? its looks good . but not so stylish . Anonymous, 31 May 2008dude a 2 inch screen 5mp phone is just stupid, and what makes it even more dumb is adding touc... morehahahaha!! I didnt know you take pictures in a 5mp cam to view them on phone screen!! Dude why dont you stick to a vga cam phone for that. You dont even need 1.3mp or 3.2mp. 5mp auto focus cam with face recognition, touch buttons, all metal finish ...that is was Soul is for. At least that what I thought it would be. period. Anonymous, 30 May 2008dude you don't see a similarity between samsung and nokia's? are you blind well lets see, sams... moreIn my opinion the touch buttons from U900 and 5mp cam are missing from this soul. I wonder why they have missed it. May be that's why some of you guys screaming about it being a copy of nokia. Give me a break. Samsung doesn't have to take design lesson. Not from Nokia atleast. They are way ahead in that department. Nokia just learned how to make a thin phone. They are still learning to make a nice clamshell. If I would desogn U800, I would have added touch buttons from U900, and the 5mp cam module from U900/U400 Soul, but the rest would be as it is. i dunno why, but it seems like there are some ppl here who actually don't know the rules of competition. The whole point of having competing rivals is to build a product that has similar characteristics and similar purposes to a leading product tho not completely make a copy of it. WE see it all da time with automobiles, take for instance the mitsu evo vs subaru sti, these cars have similar characteristics by both having a turbo engine and similar purposes of being both a rally car in their ranks, but they're not exactly the same because they're competing rivals. In the same way phones follow this trend too which this phone and the nokia 6500 is a good example of as well. - what you guys should be arguing about is meizu's version of the iphone, now thats some bs to talk about. Nokia and Samsung are both following market trends... i.e. they want to sell their products... which means that the phones have to have something that people want... so there will ALWAYS be similar aspects... put the SonyEricsson W890 into that lineup and you'll see a lot of similarities there too. Samsung CAN do better, they proved that when they pioneered the screen-in-lid flip design and I would consider the Samsung D500 to be one of the first commercially successful slider designs ever created... and that was at a time where Nokia was still knocking out bar shaped S40 handsets with Xpress-on covers and nothing else... (not to mention the U900 SOUL being a frankly gorgeous phone with NO Nokia competitive as far as design goes). where it says Quandband. Odd??? Dreamer, 30 May 2008Copy of Nokia 6500 Classic!!! Can Samsung do anithing better?? ?I don't think Samsung copied it from Nokia. As a matter of fact, Nokia is just following suit when it comes to releasing slim phone models (eg. 6500c, 2630, 5310xm). And besides, what were the stuff copied from 6500 classic as you claim?